We know how tempting it is to sleep in on vacation, but for those willing to get up early, watching the sunrise at Sunrise is something you’ll never forget. Mt. 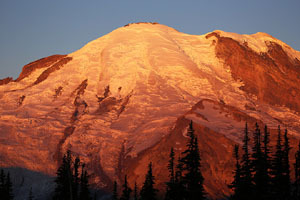 Rainier takes on a lovely pink glow just before the sun rises, with the brilliant colors changing moment by moment. It’s simply breathtaking. The best places to watch the sunrise are either Sunrise Point (about 2 miles before the Visitor Center) or from pullouts along the road about a mile before the Visitor Center. Plan to arrive at least 20 minutes before sunrise so that you can experience the full gamut of colors. Dress warmly as it can be cold, even in the middle of summer. As an added bonus, the wildlife likes the early morning hours too – and we’ve seen elk, bears, grouse and mountain goats on our dawn adventures. For sunrise times, click here.